Earlier in the year I had a look a half a dozen wines from Lalande de Pomerol from the 2017 vintage. Overall these were perhaps a little less generous than I expected. Evidently the frost had a lasting legacy here. The last two vintages 2015 and 2016 have been exciting. There is elegance and interest in 2017 amongst the wines I tasted but I’d be opting to seek out wines from those two vintages over 2017. 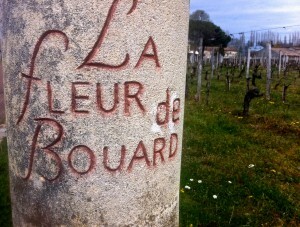 La Fleur de Boüard is the most powerful wine in the appellation. It has produced a very stylish wine in 2017. I was also impressed with Château Moncet in a lighter style, along with Château Jean de Gué and Château Tournefeuille which offer good texture and balance. The following wines from Lalande de Pomerol were tasted back in April at the Grand Cercle event at Château Dauphine as well as at the press tasting at Château Angélus. Mid depth, slightly looser at rim; more oak influence; briary; plum and cherry; nice entry initially; then the new oak arrives and dominates the palate; this is mid weight wine that doesn’t need too much oak. Finishes a little short and dominated by the oak currently. Lacks concentration. See how it develops? Tasted April 2018 at the Grand Cercle. Drink 2020-2023. 84-86?